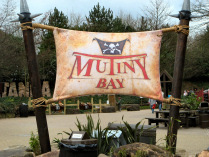 One of the two new attractions at Alton Towers next year has been named. The "Splash Battle" ride, which is being constructed on the old Splash Kart Challenge site (previously home to the Swan Boats), is going to be called Battle Galleons. The name was announced on a poster which has appeared on the fence of the construction site. It reads: "Shiver me timbers our Pirate buckos. Will be brin'in A Brand New Ride t' Alton Towers. Opening March 2008. Make ready t' set sail on Battle Galleons." The ride will form part of the Merrie England retheme, named Project Penzance. The Tea Cups are also expected to be rethemed as part of the overhaul. We've started the construction gallery for the 2008 retheme, with ten photos of the Battle Galleons site from Saturday.